As we have had occasion to note in the past, Halloween is about more than mazes, scare zones, and chainsaws. Several historical parks in the Greater Los Angeles area take advantage of the October season, luring customers who might be averse to their usual tours but find themselves intrigued by the offer of a "Ghost" or "Graveyard" tour. 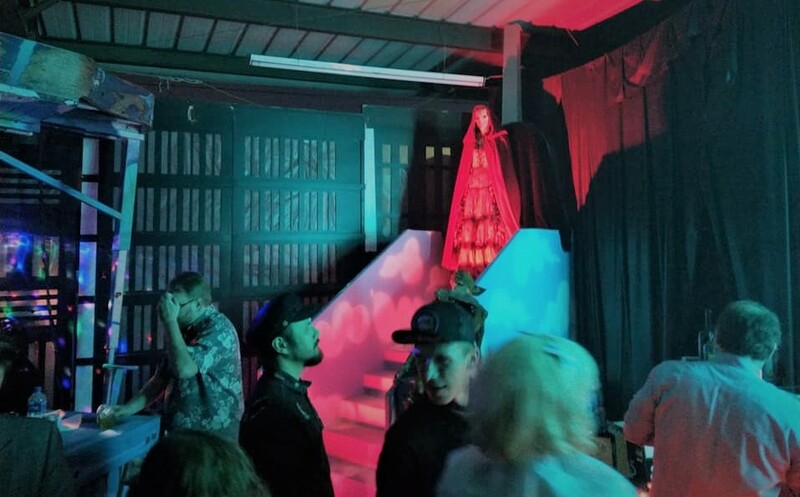 One fine example of this is the Ghost Tour at Strathearn Park, an annual event that brings to life the history of Ventura County's Simi Valley, told by dead souls from the past. The experience is not the least bit frightening (nor is it intended to be), but it hits the right mood for Halloween. People interested in history and/or in enjoying Halloween without being assaulted by costumed maniacs, will find this event to be a pleasant and educational diversion. Tours are on a first-come, first-served basis, so be prepared to wait after you have purchased your ticket. Fortunately, there is a snack table, where you can grab a coffee, candy, and/or cookies. 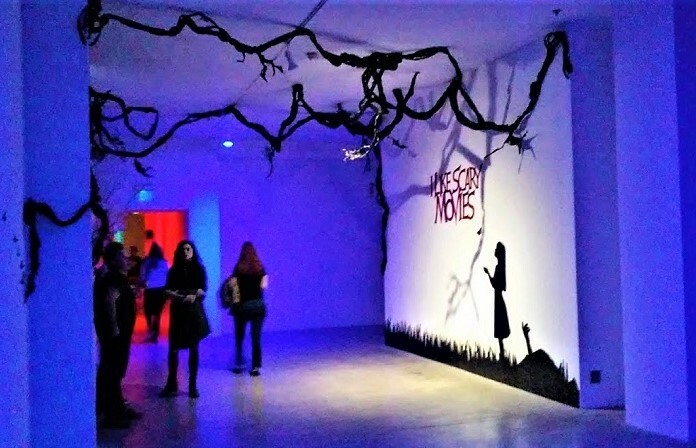 There is a friendly, community air to the event, with light-hearted "horror" movies (e.g., Beetlejuice) projected onto a screen for the benefit of those awaiting their chance to venture into the park. Through the gate, you can see tombstones illuminated in eerie blues, setting the tone; nevertheless, this is a family-friendly event, and children are welcome. The Ghost Tour begins with a brief orientation about Strathearn Park & Museum, which gives you time to adjust to the night-time exterior surroundings. The park is filled with preserved buildings from earlier times; in the darkness, eerie lights shine on the facades, and you hear voices in the distance, as previous tours make their way throughout the grounds. Soon, a guide leads you into the park to begin your ninety-minute tour. There are a dozen or so scenes, all but two of them set outside. In each case, a "narrator" provides a brief introduction to the character about to tell his or her story, then finishes with a rhyming couplet invoking the Halloween season in some way. The ghostly characters who materialize before us are clearly long dead, judging by their makeup, but they are not malevolent. Their stories range from dramatic to humorous to tragic; malicious intent toward the living is not on their minds. There is an occasional moment of interactive tension, when a character addresses him- or herself directly to an audience member, but the closest the tour comes to invoking fear is during a monologue with a crazed cult leader, blown to bits by his former followers, who promises to haunt the area until he achieves his revenge. Most of the presentations are monologues delivered to the listeners; a few are dialogues with some simple staged action. The cast is diverse, ranging from the original Indians, to Spanish settlers, to the later white inhabitants. Many of the actors (and almost all of the narrators) are very young, some barely more than children, but all of them are quite good, and one suspects their must be an impressive talent pool available in Simi Valley, if so many are available for this fundraising event. The performances occasionally slide into the tongue-in-cheek, with actors using Yiddish accents to portray Indians or posturing in overtly comic manner. But overall these are life stories delivered for educational purposes, with a touch of drama. There is even an occasional heart-rending moment of pathos, as when we see three Indian children, happily playing in the afterlife, as they recount their deaths by diseases contracted from white settlers. A bandit recalls his hanging. Perhaps the highlight is a dialogue between a bandit and his lover. His head in a noose, he considers himself a Robin Hood figure (perhaps Zorro would be more appropriate) rather than a criminal, and he insists on recounting (for the umpteenth time, we judge, from his lover's reaction) the story of the time he demanded refuge at the home of an old lady, then paid her back by giving her the money to pay off her mortgage - which he stole from the mortgage holder! After the tour, you end up in a small barn, where you get free cookies and apple cider to refresh yourself after the hour-and-a-half walk. You can buy souvenirs, and there are some wonderful books, available at discount prices, about the history of Simi Valley, which provide a fuller picture of the characters you have recently encountered in the dark. Fortunately, the Strathearn Park Ghost Tour is no strain on your endurance; the ground is level, and the two indoor scenes provide opportunities to sit down. There are no flashlights allowed, but your guide will help you avoid any stumbling blocks. 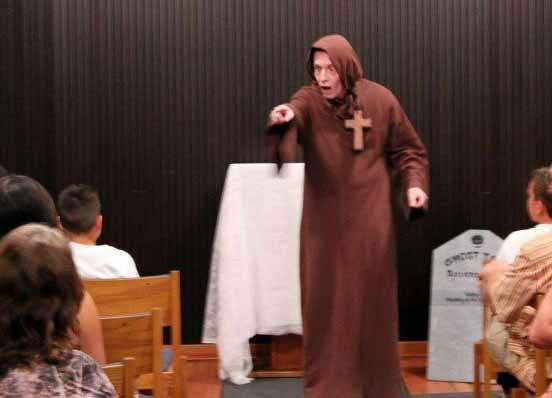 A monk accuses an audience member of greed. To some extent this event puts a Halloween mask on a traditional historical tour; most of the stories could have been related in daylight, without the Halloween trappings, but the ghoulish makeup and sometimes spooky lighting add an extra layer to the presentation, bringing the stories to life in a more vivid fashion (especially the poor little Indian girls and the crazed cult leader). 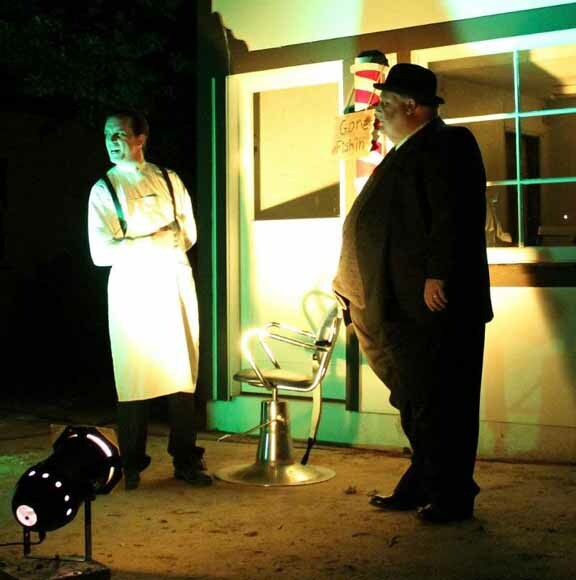 The closest previous experience we have had to the Strathearn Park Ghost Tour is 2010's Voices of Pioneer Cemetery Flashlight Ghost Tour (reviewed here); there are also some similarities to the annual Heritage Square Halloween & Mourning Tours (reviewed here). 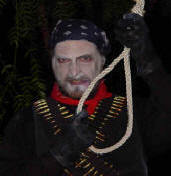 If you are looking for night-time frights, you had best seek elsewhere; however, if you are interested in seeing the ghosts of the past come alive to tell their stories, then head out to Simi Valley for an enjoyable Halloween-styled journey into history. 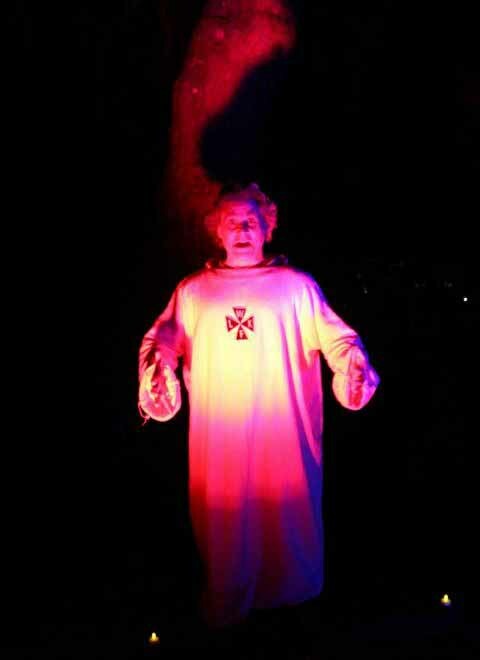 The Strathearn Park Ghost Tours continue at Strathearn Historical Park & Museum (137 Strathearn Place, Simi Valley, CA 93065) on October 28, 29 & 30; 7-10pm on Friday, 6-10pm on Saturday, and 6-9pm on Sunday. Click here for more information. November 7, 2015 Steve Biodrowski, Administrator Comments Off on West Hollywood Haunted Pub Crawl is an ectoplasmic blast of fun!